Thank you for choosing me! You are so sweet, and I'm honored. It may take me a few days to do this....as I want to make my 15 selections carefully. 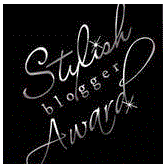 But I will pass this award on...to encourage other bloggers. Again, thank you so much! Thanks Lisa! I'm so excited! I'll have to look at some blogs and think of things about myself. Thank you so much! Hello. Congratulationzzz on your award!!! Thank you so much for considering me. I just received this award though a few weeks ago.. Thank you so much for considering me. I am happy and flattered at the same time.